1. SAFETY MONITORING SYSTEM IS RENTED AND REMAINS PERSONAL PROPERTY OF ERUSA: ERUSA shall rent, instruct the Subscriber in the proper use of the Safety Monitoring System, provide self installation instructions for the subscriber, including all necessary devices and equipment, for the duration of this agreement, with the understanding that the entire system is and shall always remain the sole personal property of ERUSA and shall not be considered a fixture or a part of any realty. 2. CANCELLATION AND REFUND POLICY: If Subscriber cancels this agreement pursuant to GBL §391-l, ERUSA will within 10 days of such cancellation and return of equipment, refund to Subscriber any amount paid for the equipment and any advance payment for services not yet rendered. 3. PAYMENTS DUE UNDER THIS AGREEMENT: Payment is due monthly in advance for the rental and servicing of the Safety Monitoring System for the term of this agreement. Subscriber authorizes ERUSA to charge my listed account when my bill is due for the term of this agreement. Payment for the rental and servicing of the Safety Monitoring System is due commencing on the first day of the month next succeeding the date hereof, and continuing monthly thereafter, for the term of this agreement and continuing monthly thereafter, all payments being due on the first of the month. 4. TERM OF AGREEMENT: RENEWALS: The term of this agreement shall be month to month. This agreement shall renew itself each month thereafter under the same terms and conditions, unless either party gives written notice to the other by certified mail, of their intention not to renew the contract prior to the expiration of any term, thereby relieving Subscriber of any obligation to pay any charge after the termination of service and return of equipment. 5. SAFETY MONITORING SYSTEM - CENTRAL MONITORING: Upon receipt of an alert signal, ERUSA or its designee communication center, shall make every reasonable effort to notify Subscriber and the appropriate municipal police or fire department or emergency personal response service designated by Subscriber. Subscriber acknowledges that signals which are transmitted over telephone lines, or other modes of communication pass through communication networks wholly beyond the control of ERUSA and are not maintained by ERUSA and, therefore, ERUSA shall not be responsible for any equipment failure which prevents transmission signals from reaching the central monitoring center or damages arising there from. Subscriber agrees to furnish ERUSA with a written list of names and telephone numbers of those persons Subscriber wishes to receive notification of emergency conditions. All changes and revisions shall be supplied to ERUSA in writing. Subscriber acknowledges that ERUSA provides no response to a personal emergency response signal except the notification to the appropriate party, and that the provisions of this agreement exculpating and limiting ERUSA's liability are fully applicable to the personal emergency response service. ERUSA may, without prior notice, suspend or terminate its services, in designee communication center’s sole discretion, in event of Subscriber’s default in performance of this agreement or in event designee communication center facility or communication network is nonoperational or Subscriber’s system is sending excessive signals. ERUSA is authorized to record all telephone conversations and shall own such recordings. 6. REMOVAL OF SAFETY MONITORING SYSTEM: Upon termination of this agreement ERUSA shall be permitted to discontinue all monitoring service and subscriber shall return, via UPS, FedEx or U.S. Postal Service, signature required, ERUSA equipment to ERUSA. If for any reason the Safety Monitoring System is not delivered to ERUSA within 7 days of such termination, subscriber shall be deemed to have purchased the equipment for the agreed value of $495.00 and ERUSA is authorized to charge subscribers credit card or bank account for such amount. 7. NO WARRANTIES OR REPRESENTATIONS: SUBSCRIBER'S EXCLUSIVE REMEDY: ERUSA does not represent nor warrant that the Safety Monitoring System will prevent any loss, damage or injury to person or property, or that the Safety Monitoring System will in all cases provide the protection for which it is installed or intended. Subscriber acknowledges that ERUSA is not an insurer, and that Subscriber assumes all risk for loss or injury to Subscriber's property or person. ERUSA has made no representation or warranties, and hereby disclaims any warranty of merchantability or fitness for any particular use. Subscriber's exclusive remedy for ERUSA's default hereunder is to require ERUSA to repair or replace, at ERUSA's option, any equipment or part of the Safety Monitoring System which is non-operational. 8. EXCULPATORY CLAUSE: The parties agree that ERUSA is not an insurer and no insurance coverage is offered herein. Subscriber's payments to ERUSA are for the installation, rental and service of a Safety Monitoring System designed to reduce certain risks of loss, though ERUSA does not guarantee that no loss will occur. ERUSA is not assuming liability and therefore shall not be liable to Subscriber for any loss or injury sustained by Subscriber as a result of any cause whatsoever, regardless of whether or not such loss or injury was caused by or contributed to by ERUSA's negligent performance to any degree or failure to perform any obligation or strict products liability. Subscriber releases ERUSA from any claims for contribution, indemnity or subrogation. 9. LIMITATION OF LIABILITY: The parties agree that the Safety Monitoring System is not designed or guaranteed to prevent any loss or injury. If, notwithstanding the terms of this agreement, there should arise any liability on the part of ERUSA as a result of any cause whatsoever, regardless of whether or not such loss, damage, or personal injury was caused by or contributed to by ERUSA's negligence to any degree or failure to perform any obligation or strict products liability, such liability will be limited to an amount equal to six (6) times the monthly payment paid by the Subscriber to ERUSA at the time such liability is fixed, or to the sum of $250.00, whichever is greater. If Subscriber wishes to increase ERUSA's maximum amount of such limitation of liability, Subscriber may, as a matter of right, at any time, by entering into a supplemental agreement, obtain from ERUSA a higher limit by paying an additional amount consonant with the increase of liability. This shall not be construed as insurance coverage. 10. 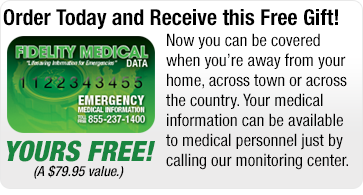 PERSONAL MEDICAL DISCLOSURE AUTHORIZATION: Any medical or other personal information provided by subscriber to ERUSA may be disclosed by ERUSA to responding emergency personnel or medical personnel. 11. INDEMNITY: Subscriber agrees to and shall indemnify and hold harmless ERUSA, its employees, agents and subcontractors, from and against all claims and lawsuits including ERUSA’s legal fees, including those brought by third parties, including reasonable attorneys' fees, and losses asserted against and alleged to be caused by ERUSA's performance, negligent performance or failure to perform its obligations under this agreement. Parties agree that there are no third party beneficiaries of this contract. 12. TELEPHONE SERVICE IS NECESSARY AND SUBSCRIBER’S RESPONSIBILITY: Subscriber acknowledges that the Personal Emergency Response Transmitter plugs into a standard telephone jack and communicates over standard telephone lines using two way voice communications. The transmitter will not work with VoIP Internet connection (cable/internet telephone) or DSL service. 13. FULL AGREEMENT/SEVERABILITY: This agreement constitutes the full understanding of the parties and may not be amended or modified or canceled except in writing signed by both parties. This contract shall be governed by the laws of the State of New York and the parties consent to the exclusive jurisdiction and venue of the Courts in Nassau County, New York. Should any provisions of this agreement be deemed void, all other provisions will remain in effect.